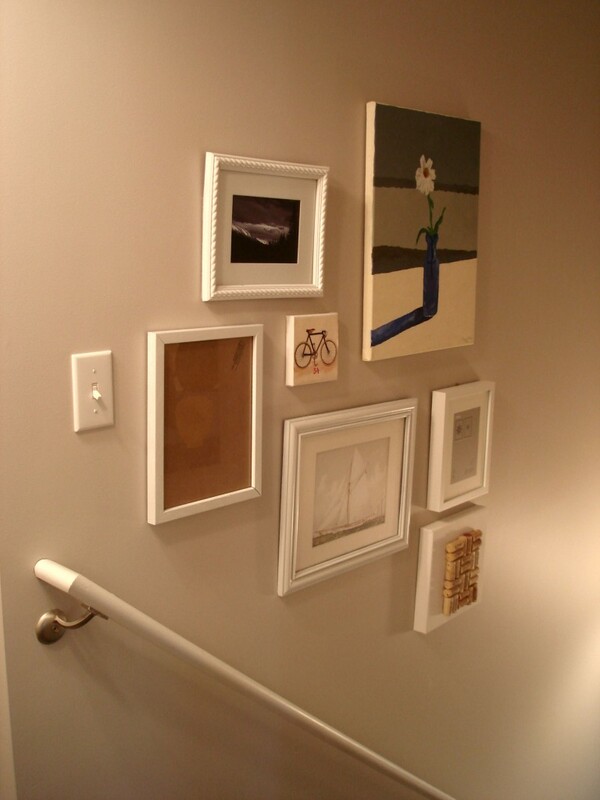 Since I’ve repainted and refinished the stairwell, I’ve been wanting to start a gallery wall (well, two really-one on each side). It’s been a blank slate for quite awhile now. I printed out a few things from Graphics Fairy- the bicycle and the sailboat. I mounted the bicycle on a small canvas and Mod Podged over it. The photograph was taken by a friend of mine, and the painting was done by yours truly a few years ago. On the other side, I started with just a few things (including an IKEA frame I picked up on my last voyage). 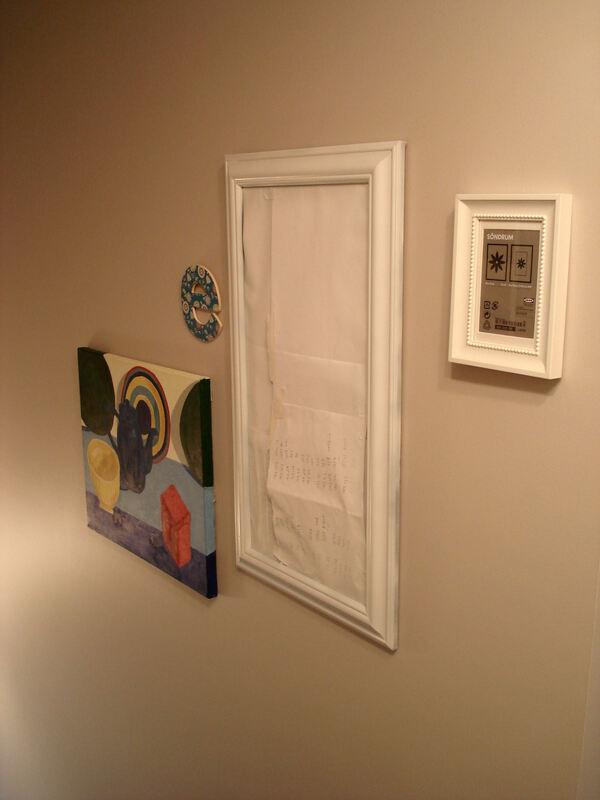 I hung another one of my paintings up along with another monogram “e” I picked up in the $1 bin at Michaels. I still have to fill in a few frames, obviously! But, in any case, it’s a start. I also changed the view from above, with the addition of a closet-door-turned-corkboard that used to live in the guest room. I’m trying to re-purpose a lot of my decor items accumulated over the years, which includes the iron leaf wall hanging. I thought it balanced the height of the corkboard and together with the plant turned an otherwise boring wall into a little focal point. I haven’t decided if I’ll keep the cork on the door (maybe pin up pictures?) or switch to mirrors or something else. I’m happy with how things are coming together so far! What do you think? Looks great so far! Can’t wait to see it all complete! 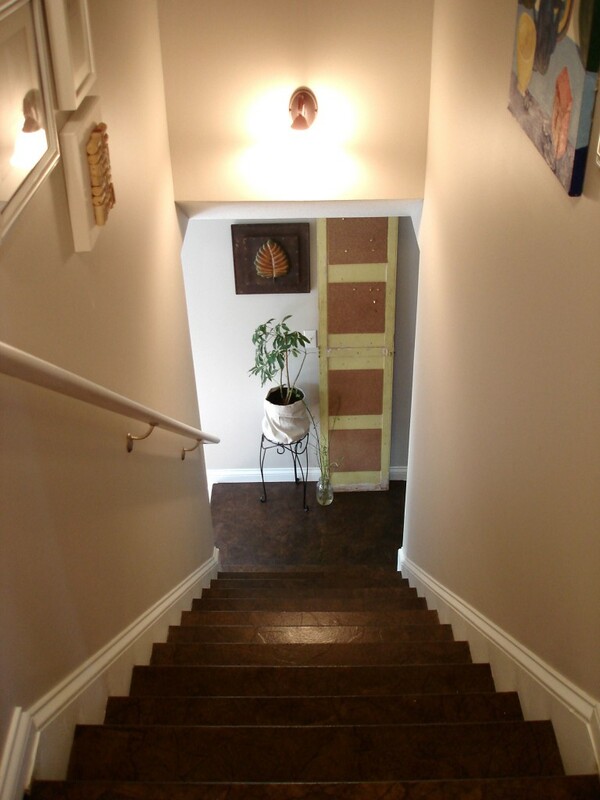 And I definitely like the cork door at the bottom of the stairs!!! Aw thank you so much! I hope to keep the projects coming! 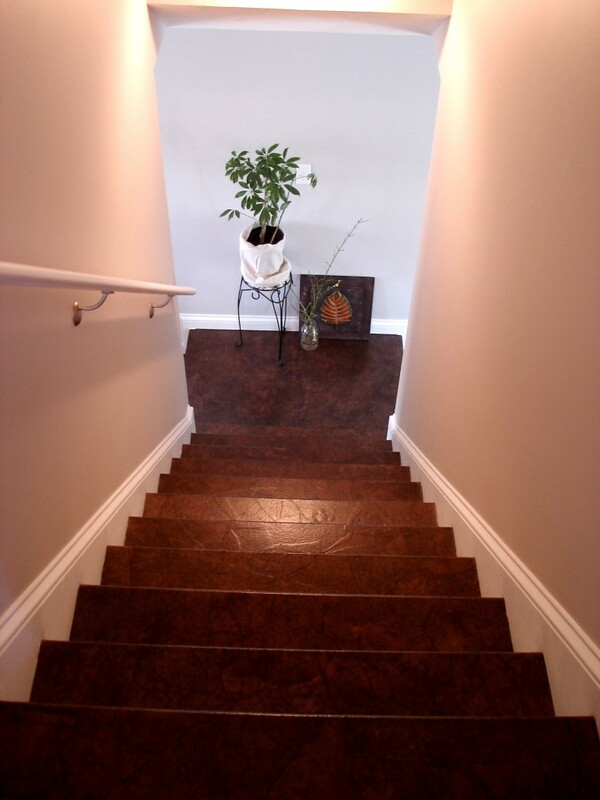 Gorgeous steps! I can’t stop thinking about this since you did the basement stairs. I keep thinking I might do this treatment to my basement stairs. You made it look so easy. Your walls are really coming along. Keep us posted! Have a great day.